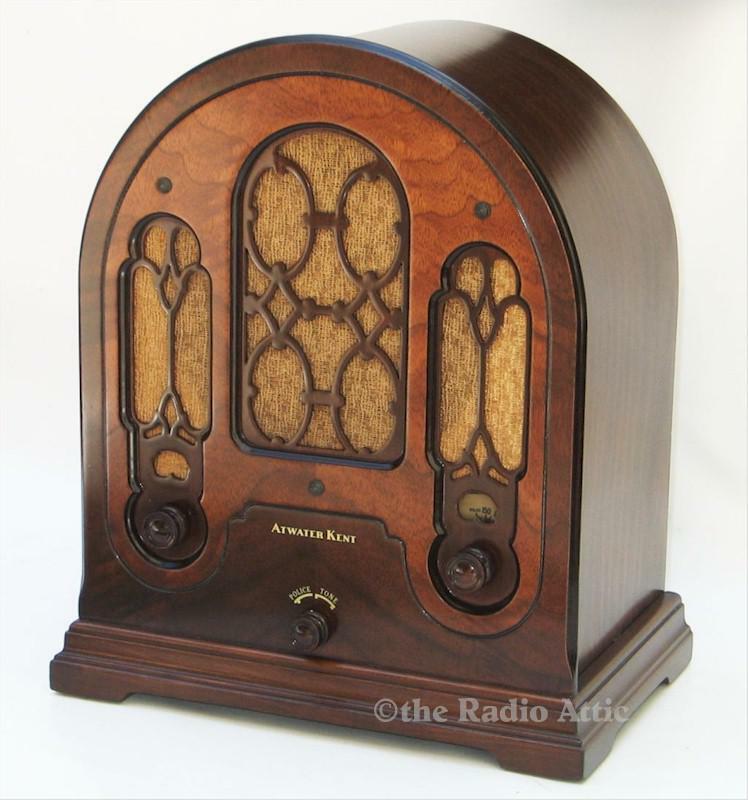 This beautifully designed cathedral radio features delicate latticework and a two-tone walnut veneer front. The refinished cabinet is in superb condition with original grille cloth and knobs. The chassis is unusually clean, with good original nickel plating throughout. Owning a radio like this in 1933 would have been a real treat -- radio technology was changing rapidly, and this radio is among the earliest to include all of the improvements that define a "modern" radio, including a superheterodyne architecture for excellent sensitivity and selectivity, an automatic volume control to equalize the volume of strong vs weak stations, a good-sounding electrodynamic speaker with cloth surround, and a vacuum tube diode detector for low distortion. Restoration included replacement of all electrolytic, paper, and mica capacitors, new resistors where needed, replacement of deteriorated wiring (including the main power transformer leads), a full RF and IF alignment, a strong set of tubes, installation of a fuse (for improved safety), and a new vintage-style power cord and plug. This radio will be a standout in any collection. 14-1/2"H x 12"W x 8"D.
You are visitor number 2,443 to this page.